The festival will take place in Hotel san Juan. 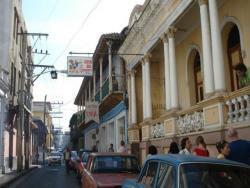 Hotel San Juan is situated in the city of Santiago de Cuba, a few minutes away from downtown. Surrounded by trees and flowers, and located but a few meters from the Parque Histórico Militar in La Loma de San Juan. Its architecture and shapes portray the unique Caribbean grace. All hotel rooms have a balcony or terrace (subject to availability).